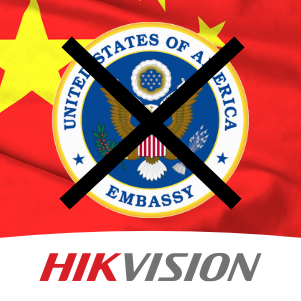 Hikvision cameras have been removed from the US Embassy Afghanistan and a procurement for more Hikvision cameras has been cancelled, after IPVM's report US Embassy Requires Hikvision Cameras triggered widespread criticism. A Hikvision camera system was initially installed to monitor non-sensitive electrical closets for theft prevention. The procurement in question was to either expand this or to install a new system. The procurement was cancelled September 2016 and the previously installed cameras were removed. Given that Hikvision is a China state owned company, the ongoing cybersecurity concerns between China and the US, and the high security requirements of US Embassies, this is a reasonable decision. However, this move sets a troublesome precedent for Hikvision who has been battling publicity of their being controlled by the China government in 2016, not only in the US but in Europe and Asia. Moreover, Hikvision has recently been expelled by Genetec, a VMS widely used by US government entities. The fact that the US Embassy not only cancelled the procurement but went further to remove existing cameras shows the level of concern the Embassy took. It is unlikely that the Embassy was even aware of these issues as they have not been widely reported until this year. As more US government departments gain knowledge of Hikvision's China state control and origins, we expect this to expand. While Hikvision has billions (both in domestic China revenue and China government loans), and has aggressively targeted enterprise US expansion, Hikvision will be challenged to overcome this. Hikvision has responded, via the China government controlled Global Times. With regards to Hikvision equipment being removed from the US Embassy, Hikvision says they cannot confirm, noting that their products are sold through 'middlemen'. They did not deny sending data back to the Chinese government. Instead, their response noted "it has always been committed to the Internet and information safety of its products, with research expenditures devoted and professional teams built up to continuously improve security." It is not clear if this is an oversight or a calculated non-denial. Hikvision did deny monitoring US 'private space' though the the bigger risk is not using the cameras to watch video but using them to access sensitive or classified data within internal networks. The fact that the China government run Global Times chose to run an article on this shows the significance of this event, even in their own perception.